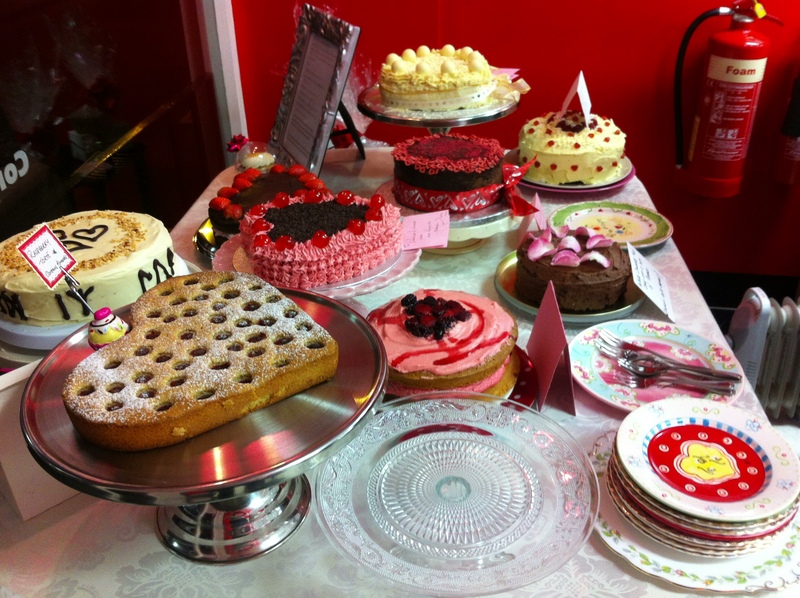 Last Tuesday was York Clandestine Cake Club’s event “All You Need Is Love” which was a perfect theme for a cake. After all, for me baking is something I do with love for my friends, family and whoever gets to try out one of my creations. We were inspired to find something that you would associate with love. It took me a while to decide what to bake. I went through all my baking books and even thought about what I had made before for Sam’s Smart Cookie orders but it always came back to chocolate. I don’t know why but I began thinking of a large chocolate truffle cake with lots of ganache piled on decorated with sugarpaste heart shapes. Inspiration came from my The Great British Bake Off- How To Turn Everyday Bakes Into Showstoppers which has been a firm favourite of mine since I bought it last August. In the first chapter of the book there is a rather yummy looking triple layer chocolate truffle celebration cake. My mouth started watering. I had never made the cake from that recipe before and was desperate to try it. Of course I wouldn’t be making three layers, just the smallest one which would amply serve 12 people. So, last Monday afternoon after I had done my usual dog walk with my black lab I was back in good time for Sainsbury’s doing a delivery. I had the ingredients for the cake itself but the cream for the ganache was on the Sainsbury’s order. I hoped it was on the order and not out of stock. Out came the 70% cocoa solids chocolate and some butter which was carefully melted and put aside. The chocolate and butter was melted in the microwave. I had had to stop on the way home from work for eggs as my daughter had used the last of them making omelettes for her and my hubby at breakfast time. Thankfully the shop had plenty of local free range eggs in stock! Four of these little beauties were whisked up together in my KitchenAid mixer until frothy along with caster sugar and vanilla extract. 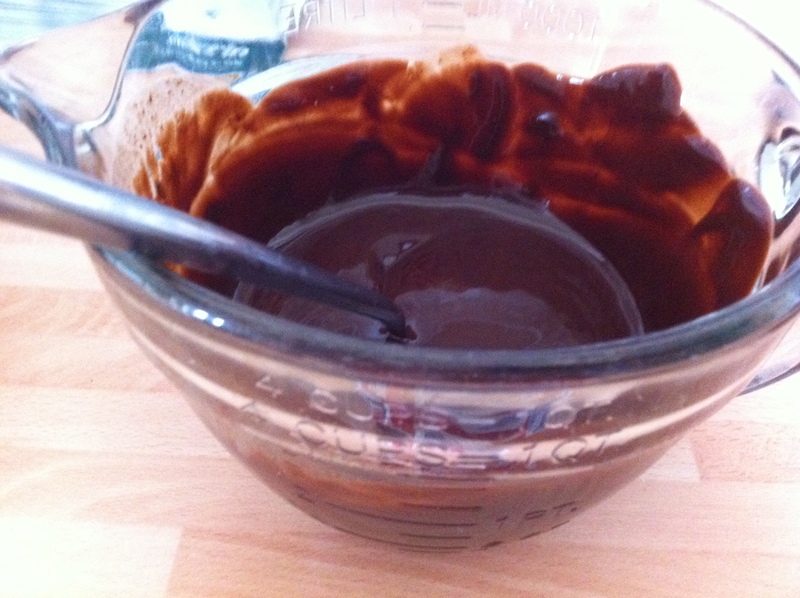 Then I added the chocolate and melted butter to the mixture. Finally baking powder and flour were folded in. 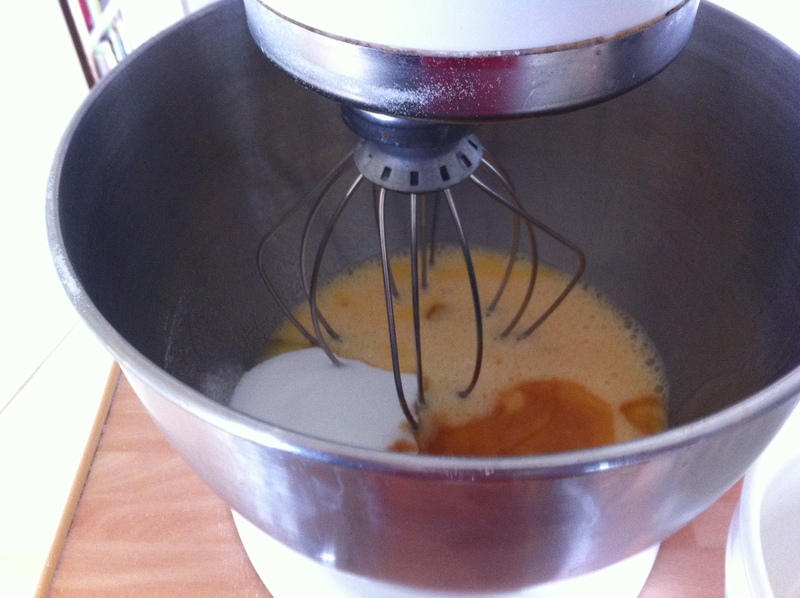 Whisking the eggs with sugar and vanilla extract together. The mixture was divided between two sandwich tins and placed in the preheated oven for about 25 minutes. As it was nearing the end of the cooking time I noticed the Sainsbury’s van parking outside. The delivery man said “Something smells nice!” and asked me what I was making. I quickly whipped the cakes out of the oven when he had gone back to the van to get the rest of the shopping out. I did not have enough chocolate left to go back making more! 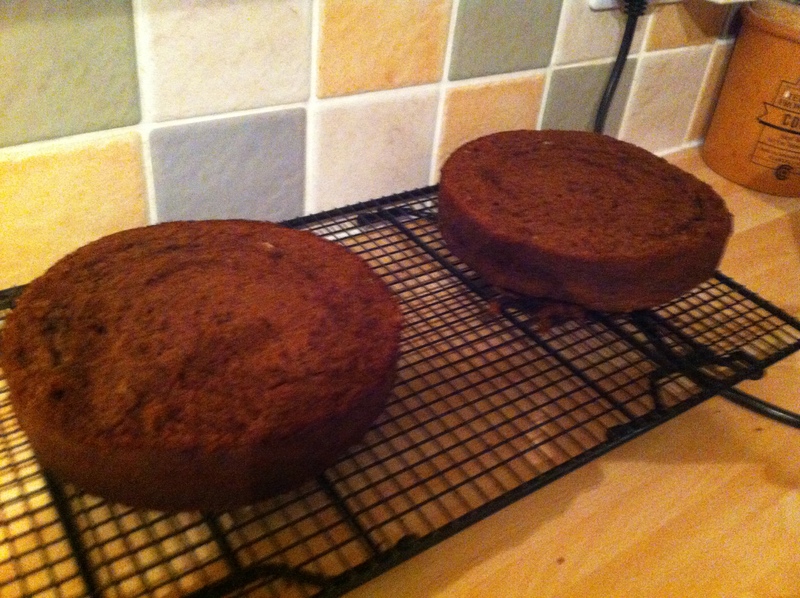 The chocolate cakes cooling on the rack. About an hour later my daughter came home from school and then I had to go out and collect my son from his After School Club. I left the cake cooling on the rack in the kitchen glad that it would be ready to ice when we got back from school. The ganache was easy to make up, I melted plain chocolate and double cream under a low heat on my hob and let it cool down so it thickened. It was still a little runny by dinner time so I decided to decorate the cake after tea. Making a mess putting the chocolate ganache on the cake! 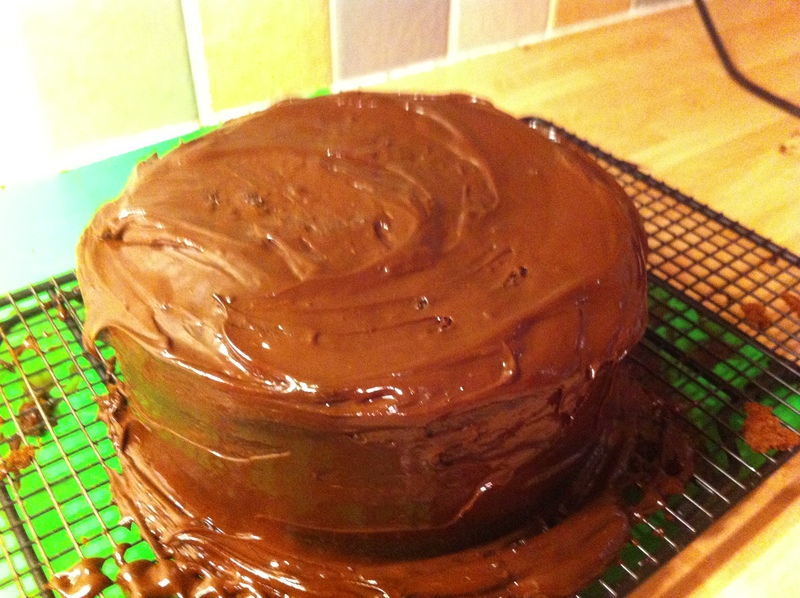 It didn’t take long to sandwich the cake together and put the ganache on the top and the sides of the cake. It was a bit runny and I always make a big mess of ganache but I kept a sheet of baking parchment under the rack to catch any drips. As a finishing touch I found some red sugar heart shapes which I had bought in Sainsburys. I then added some red hundreds and thousands sprinkled on the top of the cake. Finally on went a bright red ribbon with silver hearts to go with the love theme. All I could hope was that the cake would go down well at the event. 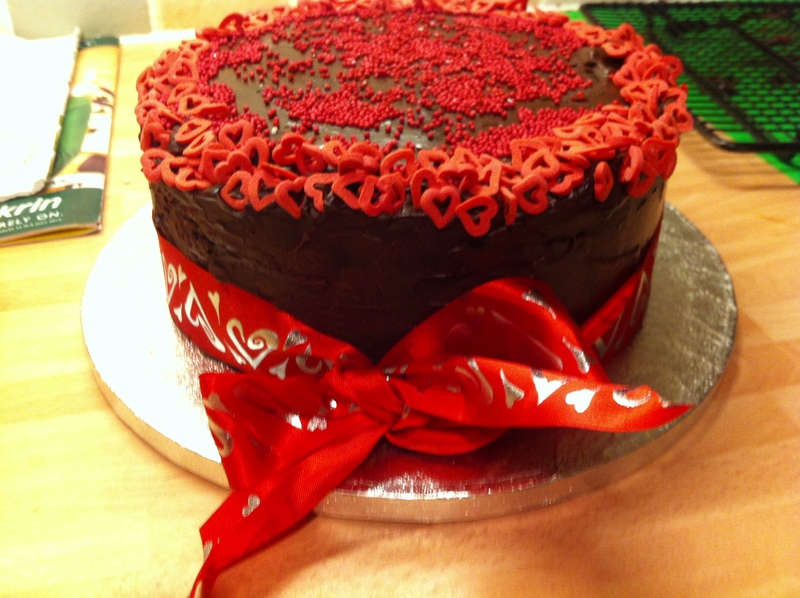 The finished cake complete with heart patterned ribbon. Think it originally came from Duttons for Buttons in Harrogate. All the delicious cakes laid out ready for the York Clandestine Cake Club event. The event was the first one I had been to outside my own group and it was lovely to meet a few new friends. We went along to the fabulous Sooty’s Cupcakery on Castlegate in York which was a perfect venue. It had a retro American diner deco theme and I noticed along with all the cupcakes and other bakes as well as the drinks it sold American candy/ sweets and some cake decorating products to recreate some cupcakes at home. I had never been there before and now am determined to go back now I know about it! Sooty’s mum served us drinks and looked after us and made us feel very welcome. We had loads of cake to try and we went back with lots of cake in the boxes we went with.